A sparkling aqua green cubic zirconia surrounded by cubic zirconia in a stunning square cluster setting with cz studded split shoulder settings. 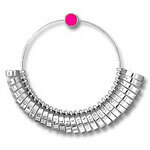 A beautiful cocktail ring or wonderful gift for an March birthday. 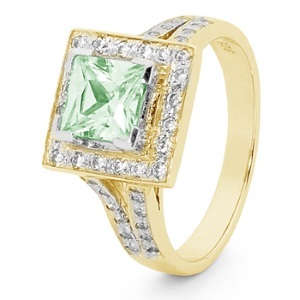 Gemstone: 1 x Cubic Zirconia aqua green square princess 6x6 mm. Gemstone: 20 x Cubic Zirconia CZ round 1.25 mm. Gemstone: 24 x Cubic Zirconia CZ round 1mm. Type: cubic zirconia gold engagement ring.